How we increased engagement 150% over the industry average using personalized video in holiday campaign. How many holiday emails do you receive? Can you remember any of them? We receive messages from friends, family, and even those with whom we have a business relationship. For companies sending holiday cards to their clients or customers, how do they stand out amidst the clutter? Our clients use IndiVideo, our interactive personalized video platform, to better engage prospects and improve their brand’s digital wow-factor. We applied IndiVideo to our own holiday email and the results were astounding. We already knew interactive personalized video was a powerful marketing tool. With a click-to-open rate increase of 150% over the industry average and an engagement rate of 80% (meaning the percentage of recipients who pressed play), personalized video proved its value once again in our personalized video holiday campaign. Use our expertise in interactive personalized video to create a holiday campaign that would be memorable, engaging, and create conversions. First, we created a fun SVG-powered video template for the holiday season with inputs for personalization (name of recipient, name of sender, and company). Then we crafted a simple and sincere email to package the personalized video. Finally, we hit send. IndiVideo delivered individual emails to our contacts, each with a link to the recipient’s own interactive landing page and personalized video. The video was the main attraction, but the landing page provided additional avenues for engagement. 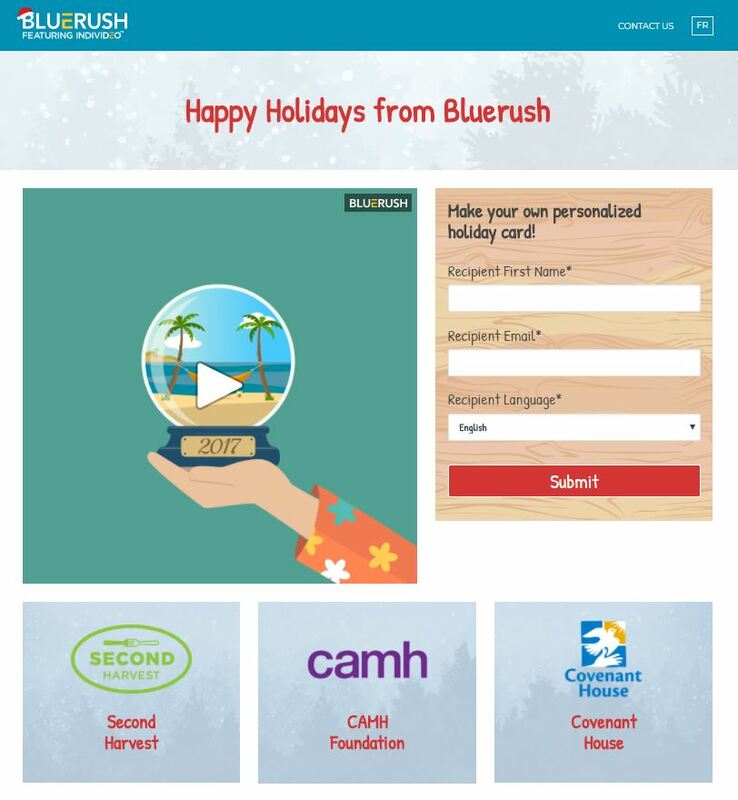 Recipients could make their own personalized video and send it to a friend, and/or they could select which charity they wanted BlueRush to support during the holiday season. Using data from smartinsights.com for industry benchmarks, here’s how our campaign surpassed all expectations. Including a personalized video in our holiday email doubled the industry average click-through-rate for our campaign. This strong start continued; 107% of those who clicked through to the video landing page proceeded to watch the video in full (that means 7% of viewers re-watched in full again!) Not only did these recipients fully engage with the video, but 52% voted for a charity to support and 33% went on to share the video with their own friends, taking the time to fill out a personalization form. Though forms can create friction in the conversion process, our recipients saw the value, and wanted to share the fun. This behavior perfectly demonstrates why personalization is so successful for sales and marketing. Part 2: From you to your friends. Though personalized video is powerful, it is doubly effective when sent from a close contact or friend. Recipients of our campaign (and followers on our social channels) were able to generate their own personalized video and email it to their friends. These emails generated more than 2.5x the industry average click-through rate, proving once again the value of sharing and receiving digital content from a trusted, named source. 121% of these additional recipients watched the video in full, meaning 21% re-watched in full at least 1 time over. These incredible results confirm that when communications are interactive and personally relevant, the campaign will be significantly more successful at engaging and converting recipients. Click here to try making your own personalized video. Just as we do for our clients, we used IndiVideo to improve upon the standard “happy holidays” email. We created a campaign that was emotionally intriguing, highly personalized, and fully interactive. This strategy works for our clients; personalization boosts sales and converts leads. We were happy to apply the same methodology to spreading holiday cheer and charity throughout our network. Interested in IndiVideo for your own campaign? Contact us!